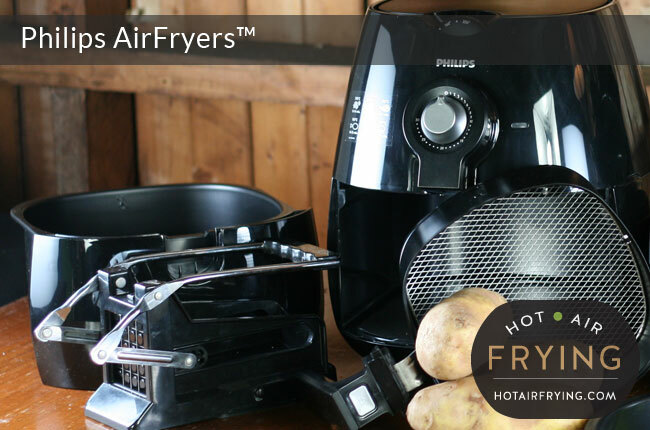 The Philips AirFryer is a basket-type air fryer. Philips has trademarked the word “AirFryer”, as all one word, combined. It was launched at the Internationale Funk Ausstellung (IFA) consumer electronics show in Berlin in 2010. We think this might have made it the second competing appliance in the air fryer category after the Actifry (launched in 2007), excluding halogen convection countertop ovens. While Actifry has opted for a flying saucer shape, Philips has gone with an egg shape. Avance XL models, larger and faster machines, which have a capacity of 1.2 kg / 3 litres / 3.2 US quarts, are digital only and run at a more powerful 2100 watts. All the frying baskets so far are solid black coated metal around the sides, with a mesh steel bottom. The coating does not appear to be Teflon. The basket rests in a basket holder. Grease drips down through the basket bottom into the basket holder. Both basket and basket holder detach from each other with the push of a button, and are dishwasher safe. The quality of the construction of the baskets is considered good in consumer reviews: we haven’t yet spotted any reports of paint flaking off the baskets as we have with some similar models by some other manufacturers. All the baskets have side slots in them: those two slots are to accommodate and hold upright a “Food Separator”, a single thin piece of metal that forms a dividing wall to keep food items separate, but that is sold separately for around $25 bucks US (2014 prices). You need to agitate / turn over food part way through cooking to ensure even air frying. You can do this just with a few shakes of the basket, usually, if the basket isn’t too full. Be careful not to press the release button while shaking. On all models so far, the air intake is at the top and the exhaust is at the back, so it’s important to make sure those two surfaces have some clearance. There’s an air filter that air passes through before exiting via the exhaust, to reduce cooking odours and air-borne grease. The inner basket-type design of the Philips models so far have an advantage “out of sight, out of mind” advantage over items such as an Actifry with its see-through lid, in that if you’re just making chips, you could forego cleaning it a few times and it wouldn’t be visible. Philips recommends cleaning after each use, however, if only to reduce smoke. They recommend that extremely greasy items such as fatty sausages not be cooked in the machines. If you are cooking items out of which a lot of grease or oil is dripping, causing smoke, you can take the basket and basket holder out, detach the basket, empty the grease out of the basket holder, re-assemble and press on with cooking. There’s no need to turn off the machine or pause cooking while you are futzing with the basket, provided you are reasonably quick about it. Philips recommends that you preheat their machines for 3 minutes, or, add 3 minutes to cooking times. It’s usually easier just to add the 3 minutes. Initially, advertising claims claimed that you could cook completely “oil free” and “fat free” even though a small amount of oil is actually required. Such claims were banned in 2012 in the UK by the Advertising Standards Authority there. Philips later launched its AirFryer Viva (Classic) model in Australia in April 2011, and in India in May 2012. Philips gives several different directions for cooking homemade fries from scratch. In some manuals, they say just to simply cook them at 180 C / 355 F. In other places, there are directions to start at a lower temperature, then to raise it. This increase in temperature, some feel, more closely mimics what happens to the temperature of deep fat frying as it regains its temperature after the cold food has been added. In the cookbook for the Viva (Classic), they recommend starting the fries at 160 C then finishing at 180 C (320 F then 360 F). In a Williams Sonoma video, the demonstrator says start at 180 C then finish at 200 C (360 F then 390 F.)  As seen in Philips Viva Digital Air Fryer video https://www.youtube.com/watch?v=bR0NReZfTP4. Accessed October 2014. Dolan, Andy. Watchdog bans Philips ad for saying fryer makes healthy chips using nothing but air… while small print advised oil was still needed. London: Daily Mail. 1 August 2012. 3. ↑ As seen in Philips Viva Digital Air Fryer video https://www.youtube.com/watch?v=bR0NReZfTP4. Accessed October 2014.